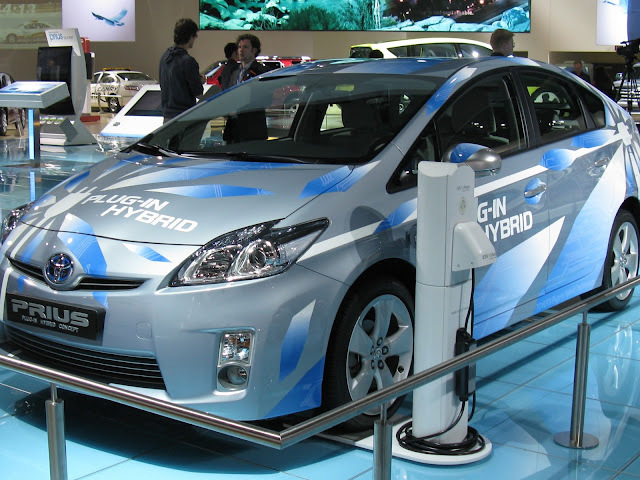 Hybrid cars have now been around for about a decade. Probably the best known hybrid car is the Toyota Prius, but what most people don’t realise is that nowadays - most car manufacturers produce at least one hybrid model. A hybrid is a car that is powered by two energy sources; namely an internal combustion engine and an electric engine. In simple terms, if you open the hood of a hybrid car, you see an ordinary petrol/diesel engine and an electric motor. However, these two separate components work in conjunction with one another to propel the vehicle. While you are driving around town, or simply accelerate from a stop position - the electric motor drives the car. The moment the vehicle reaches a certain speed, the regular petrol engine cuts in and takes over the car’s propulsion. The benefit of a hybrid car is that you don't have to charge your vehicle. The battery that powers the electric motor gets recharged when the petrol engine is working, or when the vehicle is free-rolling, like when going down a slope. Also, when the car breaks, the electric motor acts as a power generator which also charges the battery. In basic terms, Hybrid cars are the stepping stone between ordinary petrol driven cars and completely electrical cars. Many people believe that with ever dwindling oil supplies, the days of the internal combustion powered cars are numbered. While there are already several examples of electric cars on the market, but their low mileage between charge points only makes them suitable for short distances in and around town. Hybrid car companies greatly invested in the electric motor and battery technology. Hybrid car batteries still weigh a substantial amount and take up a lot a space, but over the past 10 years, they have gradually reduced in size and are lasting longer and charging faster than ever. The next stage between a petrol and electric car is now headed towards the hybrid plug-in. The car will still be a hybrid, but it can also be plugged in to charge at home. This means that the cars can have bigger batteries so it can travel farther. Nevertheless, the car will still have a petrol engine - so if you want to go a little faster, the petrol engine kicks in, which also charges your battery. At this stage, the only problem with hybrid cars is their price, since it’s a lot more expensive than a same sized petrol car. Hybrid drivers claim that the savings you get from fuel pays for the extra costs over time. But then again, detractors argue that before you get to recover the extra expenses; you’ll need to replace the costly batteries. In any case, there are numerous individuals who would never buy a regular car again and the increase in hybrid sales across the world supports this. There is no doubt that the world’s oil will run out, so it's best that humanity try to find an alternative method for powering our cars. Muun-unit is a hippie, eco-warrior, and nature-loving kind of guy - who enjoys travelling the world and cooking gourmet dishes. He is passionate about everything “green” or eco-friendly, and believes that everyone should do their part in conserving our beautiful environment. Muun-unit wrote this article for an online automotive trader, who now also offers the new spark.